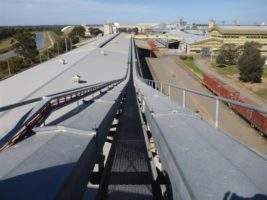 Aerobelt Australia supplies air-supported belt conveyors for the transportation of food products. 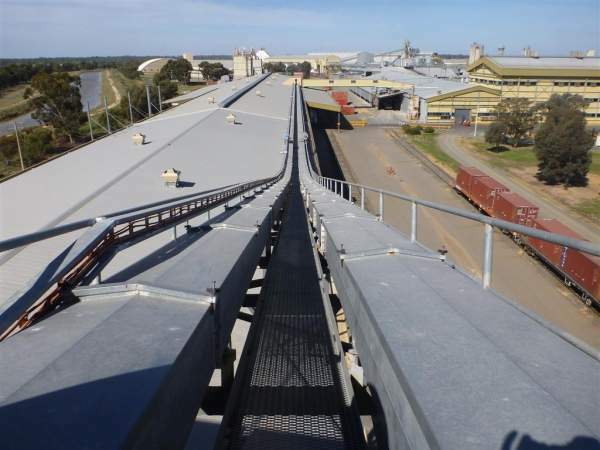 Aerobelt has supplied more than 313 conveyors to several locations worldwide, predominantly in Australia. 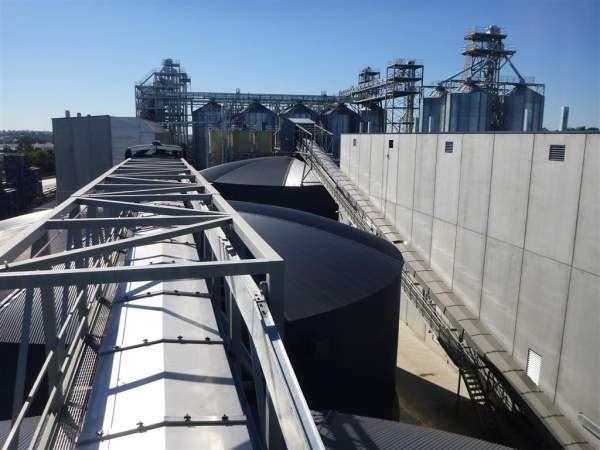 The company’s air-supported conveyors are available in various sizes and capacities to transport food produce, including barley, rice and sugar. 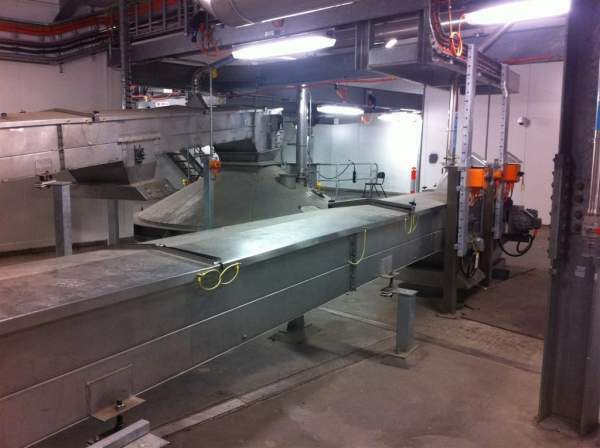 The conveyors can be used for carrying fine powders such as flour and refined caster sugars. As the conveyors can be protected from outside influences, Aerobelt uses dehumidifiers connected to fans to maintain a very low dew point within the carry section of the conveyors. 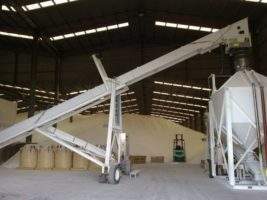 This type of equipment is used in the sugar industry where high humidity and airborne moisture can make processed sugar deteriorate rapidly. Solid bottom covers maintain a fully sealed environment for food products and allow the conveyors to be located outside between production plants and packing areas. 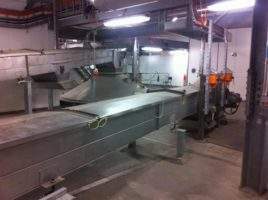 Aerobelt produces conveyors that are both vermin and weather proof as requested by existing customers. Belt widths range from 300mm to 1.8m, while conveyor lengths range from a few metres to several hundred metres and are available in a single or multi-stage configuration. Conveyor tonnage rates vary from a few tonnes per hour to more than 2,000t per hour for products such as grains, which is usually prior to final processing. Aerobelt produces air cushioned belt conveyors. The belt is carried on a film of air, which is blown by a small fan into the air box (plenum) under the conveyor belt. 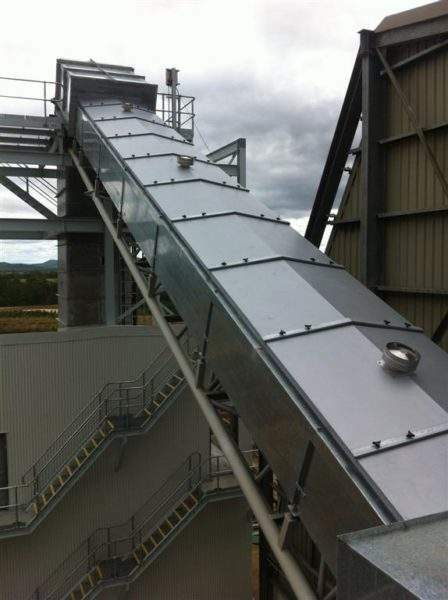 Each fan is sufficient for approximately 200m of belt conveyor. The amount of air-holes in the trough, air pressure and the volume are customised to the produce being conveyed. 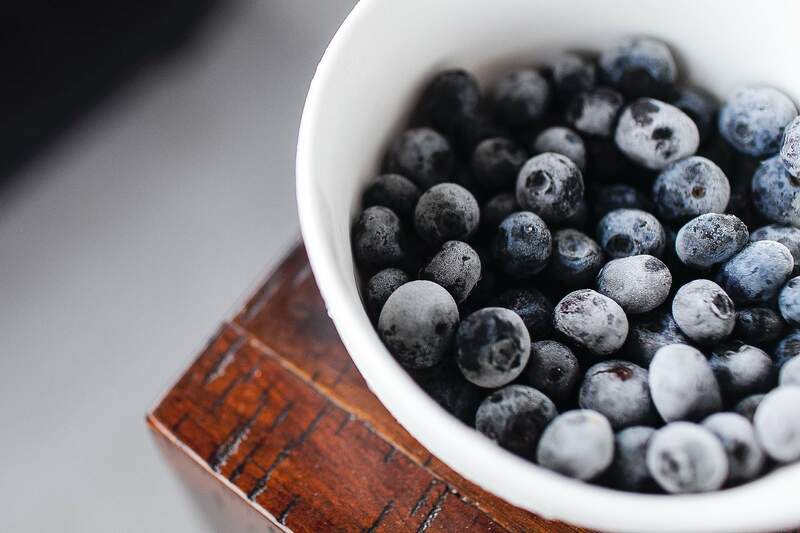 Materials used in the construction of conveyors for the food is stainless steel 304 that meets all hygiene standards used in the food industry. The steel does not suffer any long term corrosion issues that can affect the food product being carried. 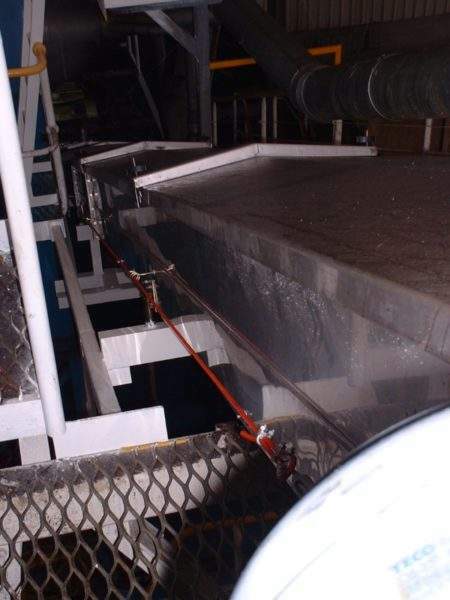 Aerobelt can make certain components of the conveyor that are in contact with the food product out of stainless steel 304, and the rest from galvanized sheet steel at the discretion of the customer to save capital investment costs. As an alternative, the company can paint steel components with food grade paint. The non-conventional construction of Aerobelt conveyors and smooth movement of product provides better control of the food as it is carried from different locations. 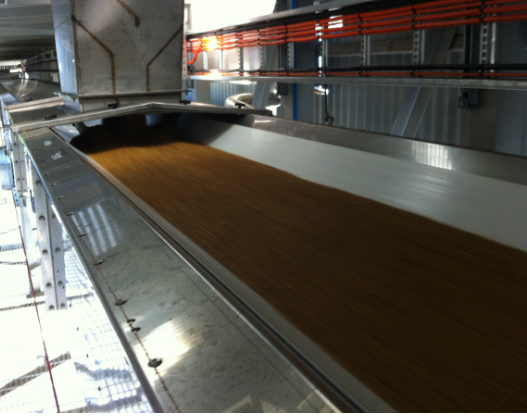 There is no agitation of the food, which reduces airborne dust generation, product loss and contamination. Aerobelt’s conveyors are suitable for use with very light powders such as flour, caster sugar, and other similar type foods. Aerobelt’s conveyors are reversible, enhancing the efficiency of both directions of conveyor feed. This feature enables the conveyor to be used in the shuttle conveyor applications and can reduce conveyor length by 50%. As required by individual applications, Aerobelt conveyors can reverse with a single or dual-drive. Unlike their conventional conveyor equivalents, Aerobelt conveyors are less expensive, and use lighter belts due to reduced working tensions. The conveyors can facilitate various belt types, including food grade, fire-resistant, anti-static (FRAS) and high-temperature belts (200°C). Aerobelt also has a range of conveyors to accommodate concave and convex profile curves to follow the curves of existing conveyor support gantries. If required, concave and convex curves can be accommodated in the same conveyor. Aerobelt can supply its air-supported conveyors on a supply only, supply and commission, or supply, install and commission basis. The company is flexible to meet customer specific requirements and provides redesign and reconfiguration of existing support steelwork and footings services to meet individual customers’ project needs. Aerobelt’s portfolio of conveyors for the food industry includes a range of standard conveyors with options available as standard. Aerobelt’s engineers have experience in design, installation and maintenance. The original refinery was to be upgraded by the addition of a new section to the manufacturing plant. In November 2010, Bundaberg Walkers Engineering approached Aerobelt Australia on behalf of Bundaberg Sugar to design and develop a new system to handle a larger quantity of sugar cane than could be handled at the plant. 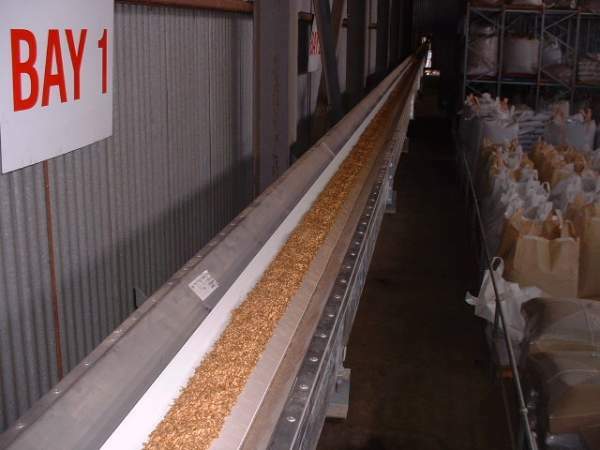 Ricegrowers needed to package various types of rice from their existing mill in Oeniliquin, NSW. Bulk Maritime Terminals required a facility to handle soda ash for distribution at Port Kembla.